Q. Why ex racehorses? Rehabilitation must be hard work. What is your strategy? Thoroughbreds have played a huge role in my life. Growing up Show Jumping I always had ex-racehorses and as a tiny girl they took the most incredible care of me. If I made a mistake in our round they would correct it and look after me every step of the way. All of these thoroughbreds had come from the horse sales and were on a path to a very sad end. When I started in the racing industry I began to realise the sheer number of horses and the fact they didn’t have many opportunities following their retirement. Thoroughbreds don’t have a great reputation as many only see them at the races where they are on high energy feeds in a highly stressful situation. They don’t take the time to see these horses away from the track. They don’t get to see animals who have had an enormous amount of interactions and exposure which can make them into the most spectacular riding horses for any ability and any discipline. I’ve made it my mission to show the world what these horses can do! Q. How did your accident and road to recovery change your mind set towards your career? My accident played a huge part in my career. I was an apprentice jockey, and with my love for horses, was so lucky to have a job where I got paid to ride. Having my fall made me realise how short life really is. I was incredibly lucky to come away from it, not only alive, but upright and decided to seize the day and try to change the world the best way I can and the only way I know how. These horses give their all out on the track and deserve just as much care and adoration away from it. Having my role on Sky gives me a wonderful platform to share the plight of the Thoroughbred and help give people an understanding of their journey following retirement. It also gives me constant contact with trainers and the chance to save more lives. Q. Tell us a story about one of your current rehabilitation horses? We have had over 50 horses come through us and on to their forever homes. We have been so so lucky with all our horses being successfully re-educated to continue future pursuits in a variety of disciplines. We have a few stand out cases. Crocka Magic is one of our most well known horses following retirement. As a racehorse he didn’t achieve much and retired early due to a suspensory ligament injury. I rode Crocka trackwork quite regularly. He was trained by Nick Olive, and was one of the most aggressive horses. He would bite and kick as you tightened his surcingle and would come at you in the box. Away from the track he is the most loving of boys and gives beginner riding lessons to quite a few kids. He is also our most recognised hacks and is currently competing in his first season under saddle. He will be competing at the 2019 royals. We also have Touch Of Reasons aka Pete who is a very special case as he has only one eye! He has coped remarkably well and is currently in work and will be competing in the winter show season. We currently have 35 thoroughbreds who all have their own little story. Q. How did you come about presenting on SKY? My role on Sky was always the dream job once I had completed my jockey career. It came a little earlier then expected! I was very fortunate to have my friend and cohost John Scorse pass on the number of the executive producer at the time. Through numerous phone calls (possibly verging on harassment) I got the chance to have a go. Thanks to the faith they put in me of Adam Hamilton and the team, as well as Racing NSW. They allowed me to progress and continue with my role today. Q. If you had to invite one person to dinner who would it be? My dream dinner would be with Mark Todd. He is such an incredible horseman and it would be wonderful to ask him any and all questions about his training methods, and his career. Q. Favourite horse ever ridden and why? My favourite horse ever ridden would be one of my showjumpers Noble Chester. He would have to be one of the smartest horses ever. He was incredible in a jumpoff and would twist and turn to stay clear. In racing, it would be a very special boy called Drop Kick. A tricky boy early in his career and would buck out of the gates but he and I got along so well. I won 5 races on him and not once did I ever have to pull the whip. He knew where the line was and would keep finding more and more. Neither were world beaters but very special to me! Q. Favourite part of your day? Favourite part of the day is either on one of our inexperienced horses when they have learnt a new thing, I feel so proud, or at the end of the day when everyone is eating and so relaxed and happy. Makes all the money and early mornings worthwhile. Q. What message would you tell other young girls who want to make racing a career? It’s a wonderful time for girls to be in racing with more support available. I would say just work hard but remember why you started in the industry. It is a tough job with sweating and tiredness often making you feel stressed, but we would be nothing without these horses. They aren’t machines and can have bad days too. We all began with a love of horses and don’t let the industry make you bitter. Q. Your vision for the future of racehorses moving into the performance world? I hope to see every discipline embrace thoroughbreds for their versatility and ability. I hope for people to become more open to the positive aspects of a retired racehorse and see how wonderful they can be. They have learnt so much at such a young age and we can reap the rewards of that in their new careers. Q. One thing you would like to see changed in racing? I’d like to see more control on the breeding of racehorses. Currently an average of 10,000 foals are born each year. Unfortunately the market for horses following their racing careers isn’t as large. It’s a very difficult thing to be able to re-home so many on a continual basis. If breeding had more regulations and criteria of the horses to be bred, I would greatly assist in their lives after racing. 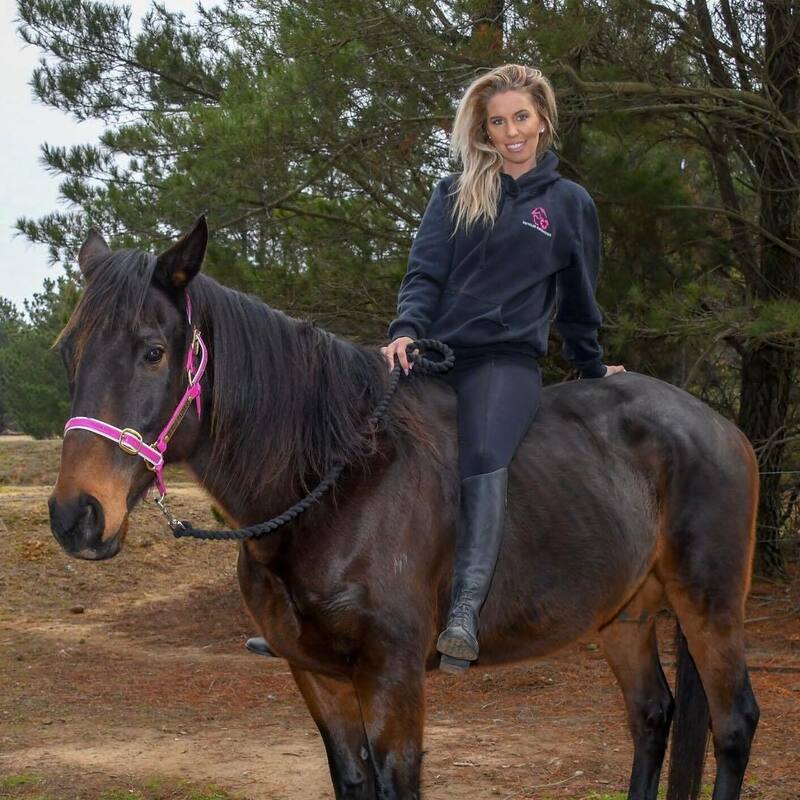 We are a proud supporter of Recycled Racehorses and you can contact Chynna via her email recycled.racehorses@outlook.com for more information on her fantastic work. To see our StrideFree® Racing range, supporting equine back health, go to our online shop.